To order from our Catering Menu please call 48 hours in advance. Click on any of the Catering Menu categories below for a list of the items in each. Fresh Italian baby kale tossed with a delicious blend of wild rice, quinoa, feta and pomegranate seeds. Dressed in sweet apple cider honey vinaigrette and garnished with crushed oven roasted walnuts. Balsamic marinated roasted red beets served over an arugula and spring greens mix, tossed in our maple balsamic vinaigrette. Topped with candied walnut encrusted goat cheese medallions, avocado and sun-dried cranberries. This unique salad is served with our house made Caesar dressing, fresh avocado, croutons, tomato and parmesan cheese. Combination of mixed greens, avocado, mango, jicima, tomato, green onion, cucumber and quinoa. Sprinkled with pepitas and currants, then dressed in mango-lime vinaigrette. A flavorful salad made with chopped cauliflower, green onions, carrots, sundried currants and cranberries. Deliciously seasoned with a coconut apple cider vinaigrette. A mouth watering array of seasonal vegetables served with our house made dip. Choose from hummus, creamy herb, maple balsamic vinaigrette, or apple cider honey vinaigrette. Our seasonal selection of succulent and yummy fruit is sliced and ready to enjoy. Our Chef’s select vegetables are marinated with herbs and then grilled and chilled to perfection. Arranged beautifully and served with house made dip. Choose from creamy herb, maple balsamic vinaigrette, or apple cider honey vinaigrette. A yummy variety of local, domestic, and international cheeses are paired with candied nuts, dried fruits, strawberries and red grapes. Includes pita chips and gluten free crackers. Coconut cashew hummus served with an array of fresh crudité vegetables and pita chips. 1. Tempeh Tu-No Salad with turmeric nut cheese, lettuce, tomato and onion on caraway rye. 2. Balsamic marinated Portabella with lettuce, tomato, onion and sundried tomato & basil pesto on kalamata olive rosemary bread. 3. Egg Salad with lettuce, tomato and onion on caraway rye. 4. Grilled Vegetables with hummus, balsamic glaze, alfalfa sprouts, lettuce and tomato on kalamata olive rosemary bread. 1. Tempeh Tu-No salad with turmeric nut cheese, lettuce, tomato and onion. 2. Balsamic marinated Portabella with lettuce, tomato, onion and sundried tomato & basil pesto. 3. Egg Salad with lettuce, tomato and onion. 4. Grilled Vegetables with hummus, balsamic glaze, alfalfa sprouts, lettuce and tomato. Our freshly made cheesecake, unique and dairy-free. Available flavors: raspberry lemon, chocolate banana, pineapple mango, strawberry lime. Our signature moist and rich carrot cake made with macadamia nuts, coconut and ginger. Iced with classic cream cheese frosting. Rich chocolate cake layered with dark chocolate frosting and chocolate ganache. Served with a drizzle of coffee caramel sauce. Gluten free cookies available upon request. Looking for a yummy gift idea for birthdays, anniversaries, co-workers, graduations, or any other special occasion? 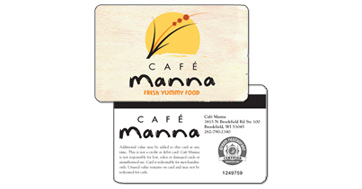 Café Manna offers gift cards in any denomination. Stop in or call today to purchase yours.